The smell of burning incense and the percussive beating of drums filled the air around the Skenesborough Canalside Park as men, women, and children dressed in Native American regalia paid homage to their heritage Saturday. Participants in the seventh annual Intertribal Powwow spent the weekend celebrating and sharing their culture. 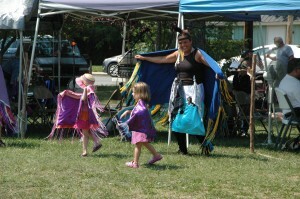 The gathering attracts several native groups and offers residents and visitors of Whitehall an opportunity to experience Native American customs. On Saturday morning, Bruchac and his son, Jesse, shared some of those customs, telling the story of a young man who was courting a beautiful woman through song. As Joseph told the story in English, Jesse would retell the story in Abenaki, one of the world’s most endangered languages. There are only a handful of people in the world who speak the language fluently, of whom Jesse is the youngest. The word “skunk” is believed to have been borrowed from the Abenaki language, one of its enduring elements. Jesse said events like the powwow help keep traditions alive. “Preserving the culture is very important,” he said. For many, the highlight of the event was the opportunity to watch Native American dancing. A grand entry was held at noon on both Saturday and Sunday and groups such as the Oneida Dance Troupe and the Abenaki Circle of Courage held their own performances throughout the day. Outside of the dance arena, sheltered from the sun by canvas tents, members of the Walking Bear Singers and Northern Coupe beat on their drums, giving the dancers their cues. Vendors selling jewelry, walking sticks, furs, books, clothing and baskets set up tents around the park, enticing passers-by to stop. Thomas Mowatt, a Clemons resident and a biology professor at SUNY Adirondack, was one of those vendors. Mowatt said he travels to several powwows each year, selling woodland crafts created from birch bark and plant-dyed porcupine quills. A self-described “Native American with Scottish parts,” Mowatt embraced Native American culture more than 30 years ago when he meant a Ojibwe family in Michigan. He made such an impression on the family and them on him, that they adopted him, making him a Native American. The powwow, which is sponsored by the Arts and Recreation Commission of Whitehall, also featured food and refreshments, sold by members of Boy Scout Troop 83, and a raffle. Jazmyn Downs, the granddaughter of Ray and Carol Downs of Whitehall and the daughter of Dennis Downs, a serviceman who was injured overseas and recently lost part of his leg, won the raffle for a carved wooden eagle. Barbara Flayter, a jewelry vendor who has helped organize the powwow said the event is a lot of fun. “It’s a good weekend for everyone to get together,” she said.